All transactions are safe and secure with a reliable history in online purchasing behind each of our associates. Buy the You Sunk My Battlestar t-shirt to own Battlestar Galactica clothing and merchandise. This Battlestar Galactica Battleship parody tee displays several familiar "battleships" on the iconic game board. 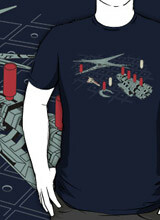 Pair it with a Frak t-shirt for the perfect gift, or wear it as you command your squadron of Colonial Vipers. The Viper is the Colonial space fighter that appears throughout the Battlestar Galactica TV series. This funny BSG tee is perfect for both aspiring Admirals and Viper pilots who believe that they have the skills to navigate their ships to victory, Milton Bradley style. In addition to the You Sunk My Battlestar tee above, browse the Battlestar Galactica Clothing Gallery for more apparel like men's and women's clothes, kids shirts or hoodies.